$300 billion. That’s the total worldwide spend on contingent labor, according to a recent Accenture report. That figure will explode over the next decade, becoming a nearly trillion dollar market, as more businesses begin realizing the benefits of leveraging an on-demand workforce. The challenge many businesses face as they increase their non-employee headcount: a lack of visibility into just how much they’re spending. Managing an independent workforce is a fairly new endeavor. Companies typically don’t have the technology or processes in place to properly capture and track all of their non-employee spend. According to an Ardent Partners report, nearly 60% of all contingent labor is unaccounted for in financial planning, forecasting, and budgeting within the average company. Total human capital costs in most organizations average nearly 70% of operating expenses, according to a study from the Society for Human Resource Management (SHRM). That’s why Human Capital Management (HCM) software has always been focused on giving insight into every dollar invested in traditional human capital; if you can measure it, you can control it (and improve it). But none of the existing HCM technology on the market addresses the booming contingent labor segment. With the sheer size and growth of this market, no executive can tolerate a lack of transparency in this category of spend. Moreover, lack of visibility in your contingent workforce can also lead to regulatory and compliance issues with the IRS, as we’ve seen over the last several months. Now take a second and imagine you could get in-depth analytics and insights into the breakdown of all your non-employee spend. How much are you spending on freelancers in California? Are non-employee guidelines from HR and Legal being enforced? What department’s hiring practices are causing a higher risk of worker misclassification? What portion of your overall contract spend went towards developers? Until now, that kind of intelligence has been almost impossible to glean. Most businesses using an independent workforce traditionally rely on spreadsheets to manage their labor costs. Even for businesses utilizing some sort of specialized software (an accounting package, a CRM or a home-grown system), the ability to manage and track every dollar spent on contingent labor has been incredibly challenging and leaves inevitable gaps in process. Those gaps can lead to the all-dreaded “rogue spend,” where employees begin engaging contingent labor on their own using company credit cards or discretionary budgets. Naturally, the problem starts to compound as you scale your contingent workforce. All Freelance Spend Under One Roof? Fortunately, there’s a new class of technology emerging designed to help businesses better manage their growing freelance workforces. 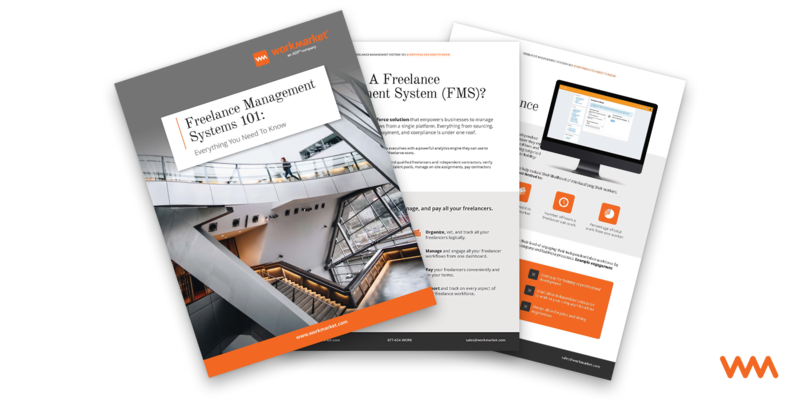 Known as Freelance Management Systems (FMS), this cloud-based technology allows business executives to find, manage, and pay their freelancers all from one dashboard. At its core, FMS technology allows businesses to consolidate every aspect of their freelance workforce under one roof. More importantly, this software arms executives with a powerful analytics engine they can use to better track, manage and understand freelance costs. How much did you spend on freelance bloggers last year? Are you tracking and receiving real-life metrics and reports on your independent technicians? What months did you have the biggest 1099 outlay? Executive-level dashboards in an FMS provide quick answers to those questions...not to mention insights into every aspect of your company’s freelance activity. A new era of freelance management is upon us; one that is transforming the fundamental dynamics between the worker and the company. By arming companies with the systems, process and data to manage contingent labor in scale, the FMS evolution will help power the advancement of the freelance economy for decades to come. Welcome to the future of work. To learn more about how Freelance Management Systems are helping companies save 16% in labor costs on average, email [email protected]. To request more information or get a free consultation from one of our workforce experts, click here. Or get started on your own by downloading our free guide below.